The investment bank turns things around after last quarter's decline in net income. Goldman Sachs Group Inc. (GS) posted the highest earnings per share in more than five years as all of its major businesses topped analysts’ estimates and the firm paid out a smaller portion of revenue to compensate employees. Net income surged 40 percent to $2.84 billion, or $5.94 a share, from $2.03 billion, or $4.02, a year earlier, the New York-based company said Thursday in a statement. That was higher than all 26 estimates in a Bloomberg survey of analysts. Chief Executive Officer Lloyd C. Blankfein, 60, has preached patience as he stuck with trading businesses that competitors pared. His firm’s 12 percent increase in bond-trading revenue and 46 percent jump in equities surpassed gains at JPMorgan Chase & Co., the biggest U.S. bank by assets. Goldman Sachs, which climbed 3.8 percent this year through Wednesday, advanced 0.6 percent to $202.25 at 8:18 a.m. in New York. Revenue rose 14 percent to $10.6 billion, the highest in four years. The firm’s return on equity, a measure of profitability that takes into account how much capital the business uses, was 14.7 percent in the first quarter, compared with 10.9 percent a year earlier. Fixed-income, currency and commodity trading revenue was $3.17 billion, up 12 percent from a year earlier, excluding accounting adjustments. That topped estimates of $3.08 billion from Barclays Plc’s Jason Goldberg and $3.03 billion from Brian Kleinhanzl at Keefe, Bruyette & Woods. Revenue from the equities division increased to $2.34 billion, excluding accounting charges. That exceeded Goldberg’s $1.73 billion estimate and a projection of $1.62 billion from Kleinhanzl. Total revenue from the two trading businesses, which are led by Pablo J. Salame, Isabelle Ealet and Ashok Varadhan, was $5.5 billion. That compared with $5.67 billion at JPMorgan and $3.9 billion at Bank of America Corp. 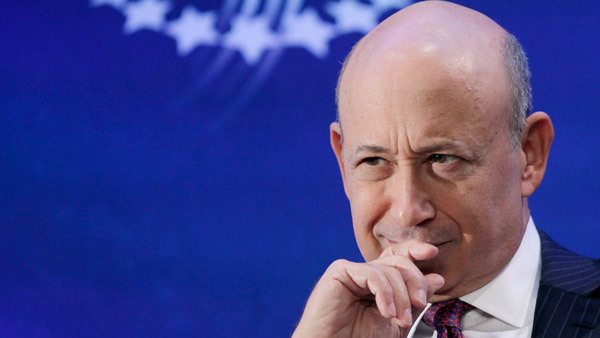 Compensation, Goldman Sachs’s biggest expense, rose to $4.46 billion, or 42 percent of revenue, down from 43 percent in the first quarter of 2014. The firm has cut the ratio in the years since the financial crisis to boost returns. First-quarter revenue from investment banking, the business run globally by Richard J. Gnodde, David M. Solomon and John Waldron, climbed 7 percent to $1.91 billion. The figure included $961 million of financial-advisory revenue, the highest since the financial crisis. Revenue from underwriting fell 14 percent to $944 million in the quarter, and included $411 million from debt underwriting and $533 million for equity offerings. Goldman Sachs holds the top spot among arrangers of global equity, equity-linked and rights offerings this year, according to data compiled by Bloomberg. It also ranks first in advising on announced mergers and acquisitions and sixth in underwriting U.S. bonds, the data show. Investing and Lending, which includes gains and losses on Goldman Sachs’s own investments in stocks, debt, real estate, private equity and hedge funds, as well as loans, posted first-quarter revenue of $1.67 billion, up from $1.53 billion a year earlier. The segment’s revenue exceeded estimates of $1.44 billion from Nomura Holdings Inc.’s Steven Chubak and $1.53 billion from Matt Burnell at Wells Fargo & Co. The asset-management unit, led by Timothy O’Neill and Eric Lane, posted revenue that climbed 1 percent to $1.58 billion. Assets under management were little changed from the end of 2014 at $1.18 trillion.